Journaling isn’t a new concept for most of us. But the idea of starting one and then keeping up with it is a bit daunting. And don’t even mention that whole Bullet Journal craze. I can’t do it. Too complicated. I’m more of a brain dump kinda girl. Every morning is like Groundhog Day for me, so keeping some kind of external record of my days is pretty much essential. Because…ADHD. This is the crazy part. My journaling habit is what has saved me. Sign up here and meet me at the intersection of information and inspiration. Journaling allowed me to see my own unhealthy thought and behavioral patterns, and it can do the same for you. I get a sh-t ton of questions about how to start, or activate to work. The ADHD brain needs some kind of kick in the pants to motivate it. 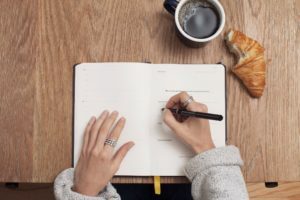 Journaling is a great way to dump out the clutter from your head, and kickstart your day. You don’t have to become a philosopher, you just have to get it out. Write about what is stressing you out or exciting you. Write about all the stuff in your head. Don’t spend more than 5-10 minutes, but use your journal to set yourself up. Over time I promise this becomes a pleasurable activity. And yes, you can do it in a word document if that is easier for you. I don’t know about you, but I am often a jumble of emotions. Journaling in a word document, or in a physical book helps me to make decisions and prioritize where to put my energy that day. If I don’t journal and get out of my head, I have no direction and my thinking goes in 1000 different directions. I’ve said this before, but for me every day is Groundhog Day. I wake up and have no clue what I was thinking about or working on the day before. I tried to “theme” my days for a while. Making Monday writing, Tuesday social media…etc. But I couldn’t stick to the schedule so that didn’t work. Now I just refer back to the journal to see WTH I was thinking about. Reading my own writing helps me to form content and research ideas for all of you as well. Every time you write your self-awareness is growing and your sense of your place in the world is growing. That is a good thing. Whether we admit it or not, every one of us wants to better ourselves. But growth mindset is tough with ADHD. We are so accustom to failure and/or criticism we have a really hard time seeing that we are learning as we go. Lets be more, do more, and laugh more together. Nobody but you is reading and judging your innermost thoughts. You can tell your journal how immature and unkind your coworker is. Or you can write down exactly how proud you were of an achievement without feeling like an egomaniac. I frequently vent my frustrations in writing because it doesn’t hurt anyone. Journaling allows you to be totally honest without fear of someone else being hurt or angry with you. My journal is where my story started to come together and where I first gathered the courage to tell it. Not that it replaces therapy, but it can help you to see patterns in your life. Patterns in relationships and your own behavior. Plus- you might realize you do need a therapist. If you already talk to a counselor your journal might be helpful in bringing to light issues during your session. I guarantee your counselor will approve of journaling. Journaling is a way to help yourself until you can afford a counselor. Digital or paper-based. If you have a large planner you might also be able to use that. I would recommend password protecting a digital document so that you feel secure in the knowledge that nobody is reading it. Keep it short and simple. No more than 5 or 10 minutes. If you are still staring at a blank page after the timer goes off, then don’t berate yourself. Just write “I can’t today” and be done with it. Maybe it’s just me but I love colored pens and post its. Fill your journal with color, photos, drawings and news clippings. Whatever appeals to you or inspires you. Decide when you want to journal and make it part of your daily routine. Date each entry, even if it is a non-entry. You may even want to have yourself set a reminder in your phone. I like Google reminders and Google Keep. The bullet journal is a big deal right now, and many ADHD adults are having success with it. I have also seen some very cute options on Amazon. 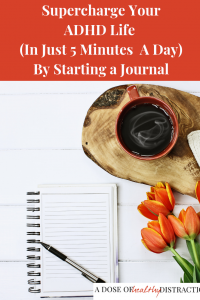 Need some ideas to get started with your Journal? « Is ADHD Coaching and Support Right For You?